The best source of information about Beagle is the System Reference Manual. For the latest hardware revision available, this can be found here. This document details every aspect of the board - from the various components on the board and their features to detailed specifications and even the board verification procedures. Beagleboard uses OMAP3530 version ES2.1. However, when you look on the beagleboard, you will not find a component called OMAP3530. This is 'cause Beagle comes in a .4mm pitch POP package. POP (Package on Package) is a technique where the memory, NAND and SDRAM, are mounted on top of the OMAP3530. The Micron POP memory has 256MB of NAND memory and 128MB SDRAM @ 166MHz. The 4-pin din connector for S-Video can carry a video signal (for TV) that is different from the one on the DVI-D output. It can support both NTSC and PAL, default being NTSC. Beagle has a HDMI connector to drive a DVI-D signal. This DOES NOT support HDMI interface, and has the DVI-D interface ONLY. Also, Beagle does not generate the analog component of the DVI-D signal, so connectors like HDMI to VGA or DVI-D to VGA will not work. In order to boot from the MMC/ SD card, the card must be a 3V, 4 bit card. As of rev B6, the reset button on the board will not work when the Linux kernel is running. To reset the board from the kernel operation, a power cycle is required. The user button provided on the board can have two uses: (a) to force a change in boot sequence (b) as an application button that can be used by software as need be. If the user button is NOT pressed while the RESET button is released, the boot sequence is NAND -> USB -> UART3 -> MMC1. If the user button is pressed while the RESET button is released, the boot sequence becomes USB-> UART3 -> MMC1 -> NAND. One cool way to power up Beagle is to use a USB to 5.5mm barrel power adapter cable as pictured below. The self powered USB hub could power, among a variety of other peripherals, this cable as well - this could be used to power up beagle! Beagle has a switch that ensures that when both USB and the power adapter are connected, the board powers up using the power adapter and not the USB. USB in this mode will function either in client/ host modes as need be. p.s. 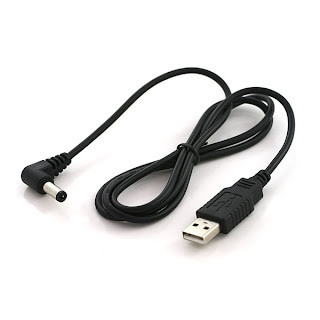 : The USB to 5.5mm barrel power adapter cable is available at Sparkfun. However, if someone knows how to get this cable in India, please let me know. What would be even better would be a DIY article for the same (Add to Me's homework! ).